Oh, Ladies and Gentlemice, what a night I had! It took me like a whole day to recover, which is why you’re getting this post on Friday instead of Thursday. First, I will explain my OMDD strategy, which turned out to be kind of foolish. I had no idea it was going to be that crowded. 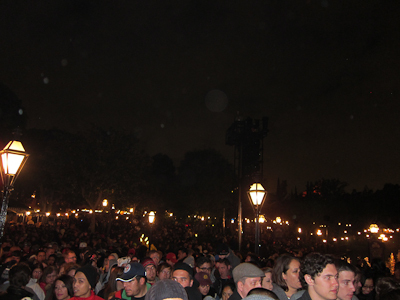 I don’t think anyone else including Disney thought it was going to be that crowded. I have never, EVER seen it be that crowded. So kind of the theme for the night is crowded, right? I thought that I would head over around 9 or 9:30, check things out for a couple of hours, then come back home and sleep in my warm, comfy bed. 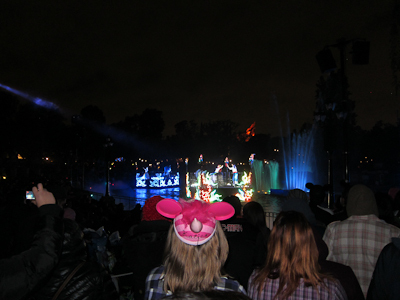 There was a 1am showing of Fantasmic, which I thought I’d probably skip, given my short excursion. I left the house at 9:30. It usually takes me 10 minutes to get from my door to the parking garage. I had heard that Mickey and Friends (the garage) was full, so I cleverly decided I would head to Toy Story, the other main lot down Harbor. It wasn’t until I got stuck on Harbor that I realized what a mistake I’d made. 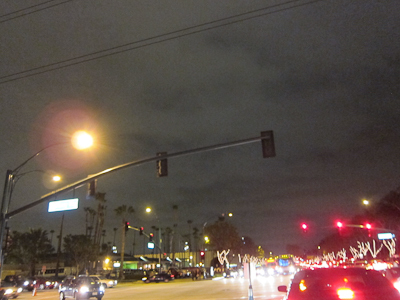 This rather innocuous looking picture does not even come close to showing the horror that was Harbor Blvd. Now the problem with Harbor is if you’re heading south, once you cross Ball Rd. you’re basically stuck with nowhere to turn off until Manchester. Which is normally not a problem, until you spend 45 minutes getting from Ball Rd. to Manchester. Which is like 3/4 of a mile or something. I opted not to pull off at Manchester, since the Toy Story lot was well down Harbor and I wasn’t sure if another route would be any faster. Another 45 minutes later, I reached Disney Way, my only other opportunity to pull off. At this point I had to make a calculated decision. 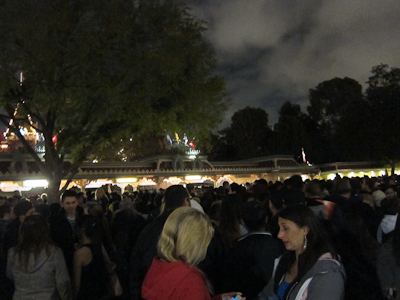 The Toy Story lot, which seemed like a sure thing, was further down the packed Harbor. 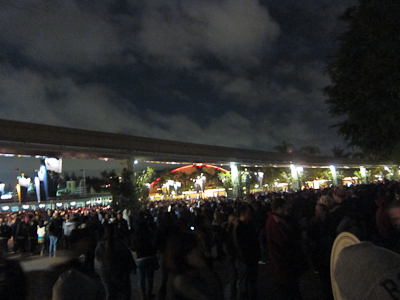 And when I say packed, I mean people were getting out of their cars to take pictures of how packed it was. Anyway, there’s also the Pumbaa lot. Pumbaa is an overflow lot and is located on Disney Way just north of the Gardenwalk. Sorry. Anyway, I’m not moving on, because I feel like you should get to experience some of the horror that was Harbor. Okay, moving on. Pumbaa is generally an unmarked lot. I pulled out through Disney Way and did the U-turn and as I was headed toward Pumbaa, I didn’t really see very many cars going into the lot. 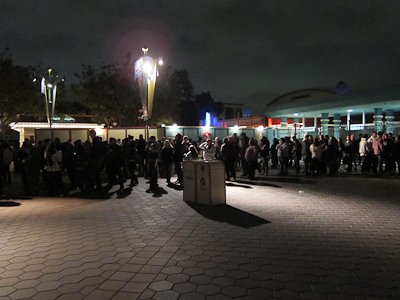 It made me wonder–was the lot closed, or did people just not realize it was actually a Disney lot? By the time I got up there, I figured out that it was the latter. The lot was unmarked and unattended, not even with a ticket booth. The entrance driveway was blocked off with cones, but the exit driveway was clear, so I drove through the exit and easily found a spot. DO NOT EVER TRY THIS! On normal days the Pumbaa exit is a throughway for Disney tour buses and driving through the exit is very dangerous. And this, my friends, is what we call a local advantage. Because if I hadn’t known that the Pumbaa lot was, you know, actually the Pumbaa lot, I never would have figured it out. Anyway, if I had gone down Anaheim Blvd. to Katella to the Downtown Disney lot as Kevin and Theo did, it would have been fine. But that’s neither here nor there. This turned out to be the easiest wait of the evening. 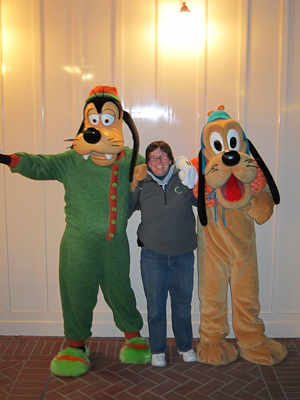 Because when I made it through bag check, the gates to the park were closed. At it was 11:00pm at that point. 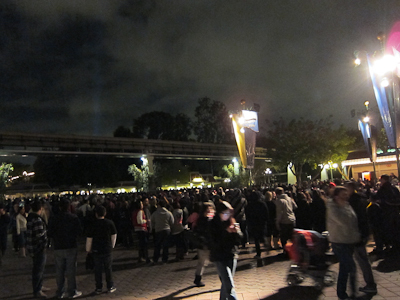 I had thought for sure people would be leaving the park in droves to go, I don’t know, do something else. Nope. It was a mess. Now at this point, anyone in their right minds would have gone the hell home, but I have a blog to uphold. A BLOG!!! So I decided to stick it out. Plus I was really pissed off about having taken an hour and a half to park. While we all stood there not moving in any sense at all, except when people toward the front decided it wasn’t worth it and went the hell home because they were apparently in their right minds, there were cast members walking around telling everyone that the gates were re-entry only, and you had to have already been in the park earlier that day and gotten a hand-stamp. Oh no. No I did not. I decided to take my chances, which later on turned out to be the right thing to do, as I didn’t get turned away. And we all stood there waiting for the gates to open. The park was crowded beyond fire hazard, so they had to wait until a bunch of people left before they would let any of us in. HAPPY ONE MORE DISNEY DAY!! Finally the waiting paid off and we got inside. As soon as I walked in the gates I let out this war whoop. I couldn’t help myself. Everyone was doing it. I mean, stand outside the gate for an hour and 45 minutes and tell me you’re NOT going to scream. Trust me, you would have screamed. Yeah baby, I’ve been waiting 3 hours and 15 minutes to see your pretty face! The banner, not the random lady. I wasn’t sure what to do next. The crowds were insane. I have never seen so many people there in my life. 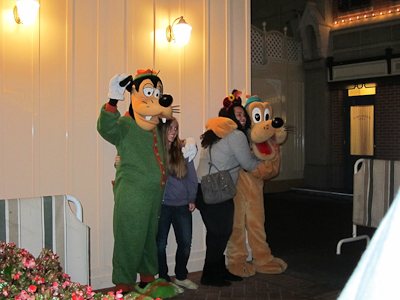 So when I spotted a Goofy and Pluto meet and greet right by the Mad Hatter, I jumped in line. And I was luckily the second-to-last person in that line. 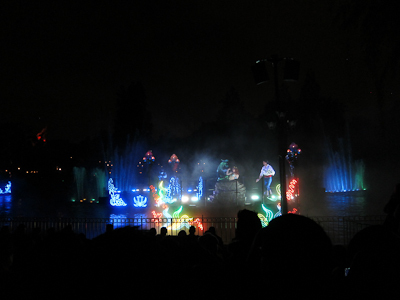 After that I decided to head over to Fantasmic. Because it’s not like I had something better to do. 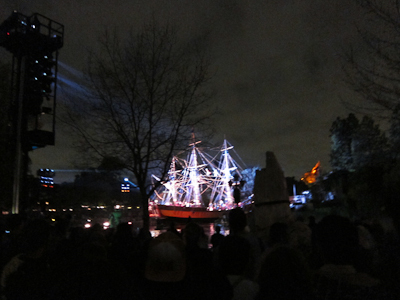 Cast members did the typical crowd sweeping thing with their light sabers flashlights, where you’re not really allowed to stop and look at whatever you’re not supposed to stop and look at (in this case, Fantasmic). Normally this happens only for really crowded areas, but in this case “really crowded areas” applied to pretty much the entire route. 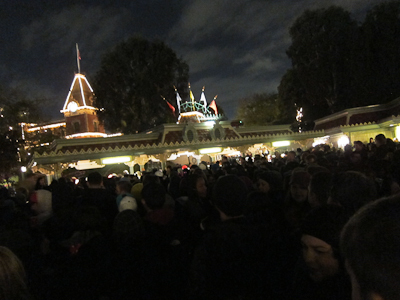 For Disneyland familiars, we got shunted from the hub through Frontierland, all along the Rivers of America away from Adventureland up to Haunted Mansion, the turned around before they let us do what we wanted. It’s not 11am tomorrow, it’s 11am today! 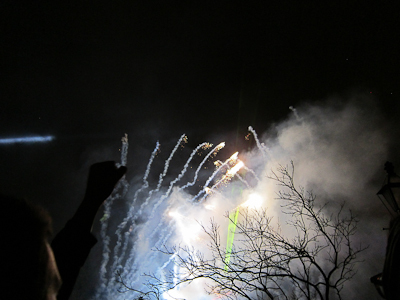 Seriously, my favorite part of that picture is the dude next to me with his fist up. 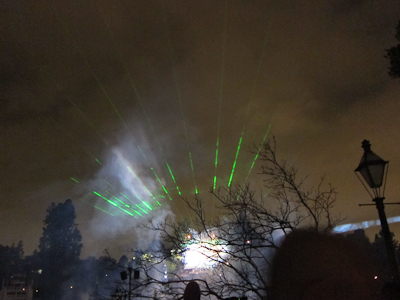 I mean at the closing of Fantasmic there were screams everywhere, but this guy is all like ¡Viva la Revolución! You know? Anyway, after that, it was a mess. wall to wall people. I’m not exaggerating. 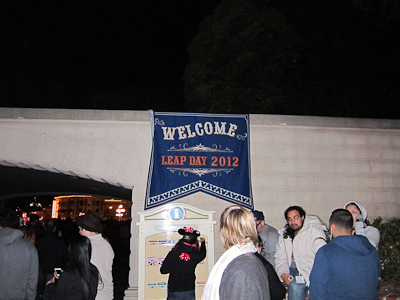 After letting the crowd thin out ever-so-slightly, I headed back to Adventureland. It was fortunate that I wanted to go there, because I literally had no other choice. 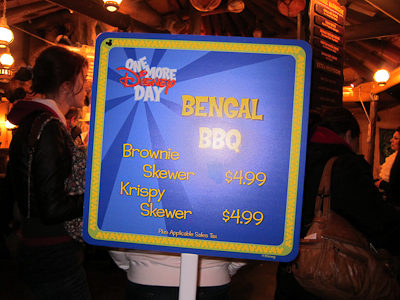 Anyway, of all of the various special food options, the Bengal BBQ was the one I had my eye on. I couldn’t decide what I wanted, so I got both. 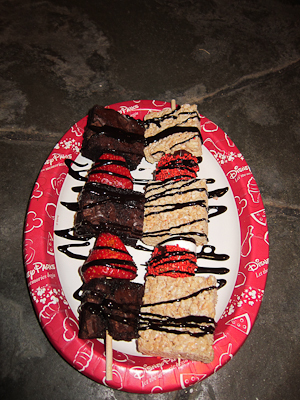 On the left were brownie chunks separated by strawberries; on the right were krispy treats separated by chocolate-covered sprinkled marshmallows. 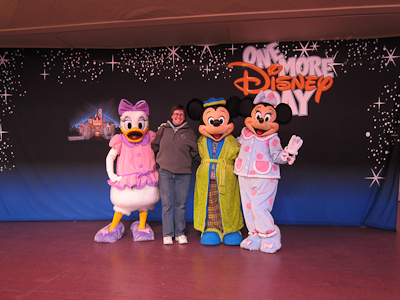 I sat down very briefly to eat, and then thought well, the one other thing I REALLY want to do is to get pictures with Mickey and Friends. Who were all conveniently located in the Carnation Plaza. They were all wearing their pajamas too. Adorbs! 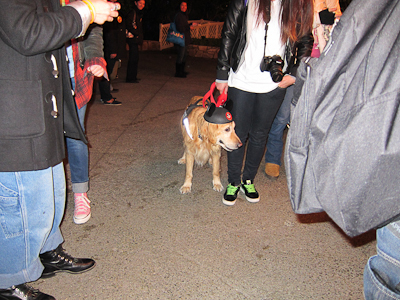 Oh, but also adorbs was this service doggie wearing mouse ears. 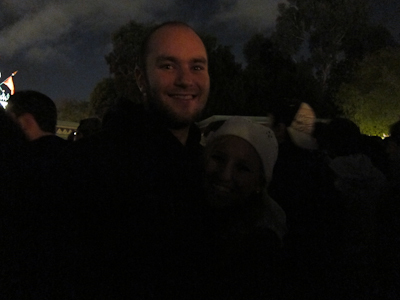 The best thing all night happened here–while we were waiting, a guy and his presumed girlfriend got up to the front. In between all the characters, the guy dropped to his knee and proposed. The girl said yes, and everyone cheered. It was so heartwarming and adorable! Really, that was like the highlight of the night. 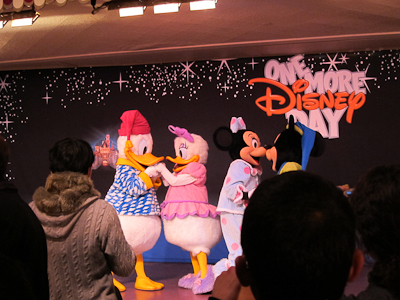 Anyway, right before it was my turn, Donald decided to go take a break or whatever. 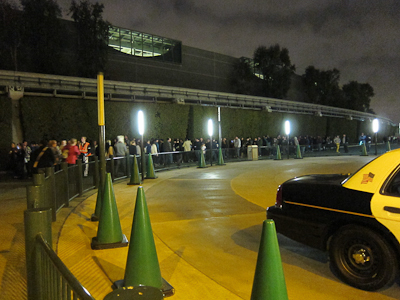 I was a bit miffed, because it took me AN HOUR AND A HALF to get to the front of the line. Sorry, I know I said I wasn’t going to use all caps anymore, but AN HOUR AND A HALF, PEOPLE!!! 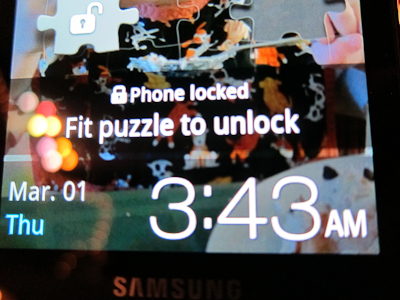 We are talking THREE O’CLOCK IN THE MORNING HERE. I also had to give my thanks to Mickey. And by the time I got back to my car and navigated more traffic, I got home around 4:15. 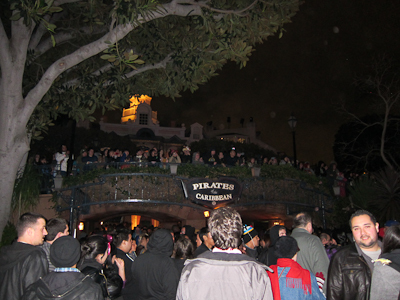 Oh, and when I left, there was still a line of people to get in. Seriously, I don’t think anyone had any idea it was going to be like this. I certainly didn’t. 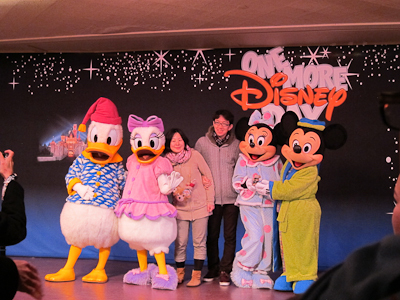 And that was how I spend MY One More Disney Day! Can you kindly edit your post by adding a warning or ”do not attemp this” regarding entering the Simba lot trough the exit. The reason the exit in Pumba is left open is because that is where the big Disney guest tour buses exit out. If a car enters through the exit while a tour bus is exiting the results can be deadly. I was there from 6 PM to 6 AM, and I lucked out with the timing. Not an hour later, and I would have been stuck with the crowds trying to get in. 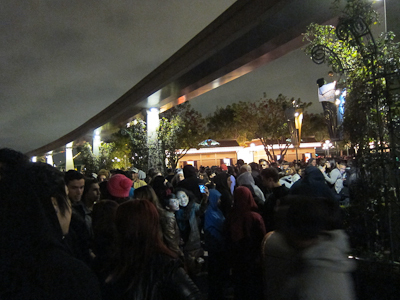 It was relatively calm when I came though, except for the line to enter that stretched to Disney California Adventure Park. 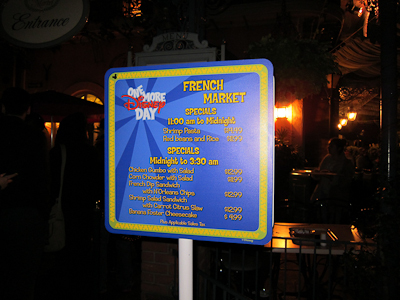 I walked around mindlessly like a zombie for most of the night, reminding myself that the prize was the 6 AM announcement, and not a million dollars. We likely brushed past each other several times. Excellent post, and lots of laughs and memories from that special night. 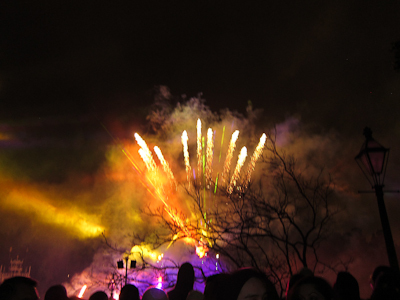 C) Do you know how the park eventually closed and how they started the next day? Or how much time was between the two days? 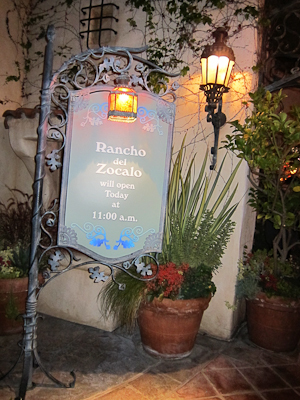 The park closed at 6am and re-opened at 10am. 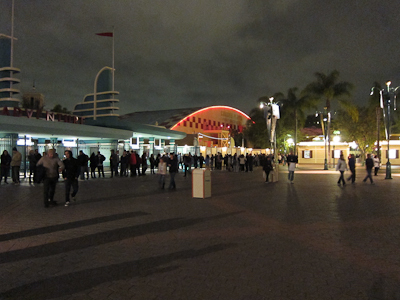 Many attractions closed for periods throughout the night, presumably for cleaning and basic maintenance. Loved it. Great fun reading the blog. Wow! So cool–and great pictures too! 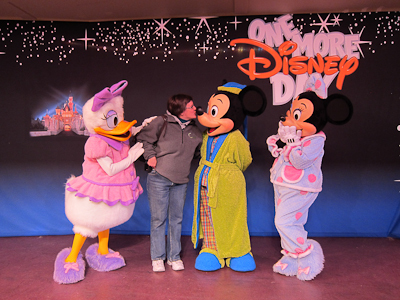 You look like you had a wonderful time–though I take it you didn’t get there early enough to get the free mouse ears. Oh god no, the only ones who got the ears were the first 2,000 in the door at 6am. Most of those people camped out. I’m so jealous you went late at night! 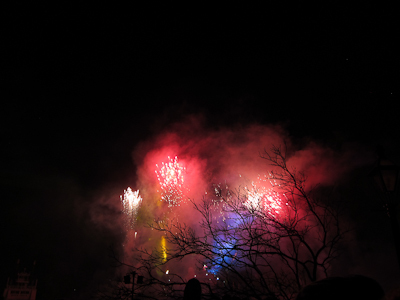 Despite the crazy crowds I am impressed you grinned and beared it to make the most of your extra day. I love the story of the proposal too!! I’m not ashamed to say my eyes welled up a little. Gotta love the magic of Disney! Oh I totally teared up at the proposal too. It was so sweet, and all of the characters totally played it off. Donald took the girl’s hand and pretended to “examine” the ring, looking like he approved. It was really fun. Thank you for posting the report! And taking one for the team… 🙂 It’s amazing how many people were there… I think I’ll stick to off-season visits. One of these days I’m going to have to brave the crowds just to see what it’s like. Great report and just remember it only happens every 4 years. Next time you and Theo can brave the masses. Well, this is the first time it’s happened, and honestly I doubt they’ll do it again four years from now. It was kind of a mess. If they do it again, I would predict that they would block the SoCal annual passes and/or sell event tickets like they do to Mickey’s Halloween Party. Once you mentioned the Bengal BBQ I knew I saw you and thought you seemed familiar (from micechat)…you sat and ate in front of the closed Adv. store right?? My night wasn’t much different from yours but it wasn’t unexpected though I did expect it to thin out a bit after F! but alas no DICE. Was it the Asian couple in your pic that proposed?? Yes, that was me! 😆 I did take a breather on the ground there to let some of the crowd go by. So funny that you came across me in that ginormous crowd of people! Next time, say hi ;). No, the Asian couple in the picture weren’t the ones who got engaged. Unfortunately I didn’t have my camera out at that time–would have been some great pictures. It was great meeting you and Shelley! So glad to hear you had a good time. Looking back, the crowd was part of the experience! And I’m glad you had a few other days to spend here too. Such a funny post!! Seriously I snorted out-loud right in my office. Just love your honest style – don’t ever “move-on”. 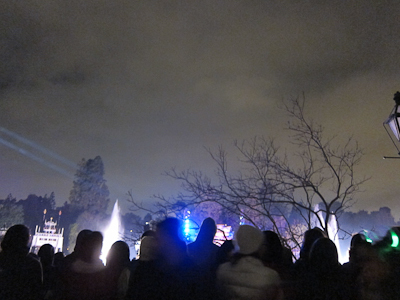 Thanks for braving the crowds to let us out of towners get a glimpse. 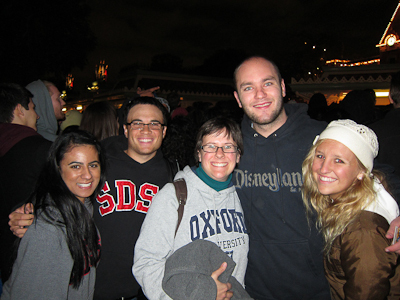 Pingback: Question What was your Biggest Mistake Ever at Disneyland?